I am trying to duplicate the paint code sticker that goes in the left door jamb for my 74 restoration project (paint code L80E). I am having a problem trying to determine the actual size of the sticker itself. 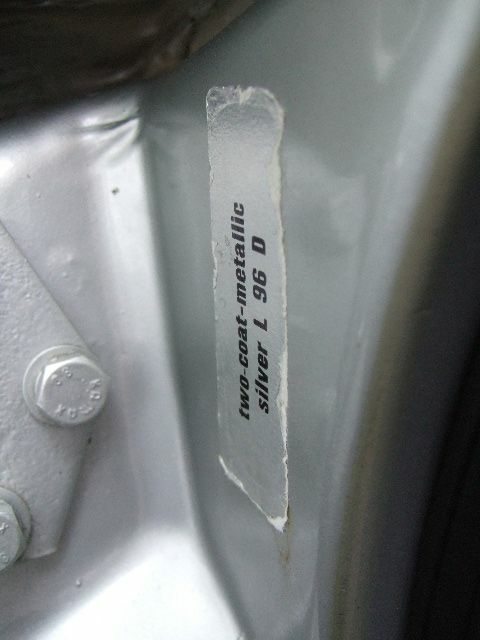 Does anyone have a car that still has the paint code sticker in the left door jamb? If so, could you provide some measurements of the actual size of the sticker as well as the font height? See the links below for reference. Maybe some of the local PNW-teeners will have a car with their color sticker still intact close enough to you for reference? Tod914 may be another reference for the size & material, as he's restored several 73-74 preservation class 914s over recent years, although I think all are sold now, but he may have good pix & idea of size. PM & email him off the search members, cuz I've not seen him on here for awhile & I think he was moving from NJ to TX too. I'm restoring my 73 2L L80E as well, so would be willing to share repro costs with you if not too much, to make one for my resto. Just send me an email/PM when you have costs & more info. If you can repro with the ability to drop in any color code & name, then you'd get a better audience/customer base, and 911/912 guys would also be possibles too, as I think the stickers were the same (you'd need to research that). Thanks for the help. I will PM Tod. I found a label company that will print just about anything. They have the foil labels and, if needed, will cut custom sizes. I have ordered just about ever stock size label that would be close but I cannot get a tight bead on the size. See the pictures below. I didn't stick the label down fully on my car but I wanted to see how close I was getting. At this time, too narrow of a label and the corners are too rounded. I'm working on the font also. The one I used is close. Let me know what you think. Their font was a condensed font - Helvetica or similar I think, and maybe the semi-bold vs. your bold font standard width. Corners are indeed more rounded than original, but you could use square & cut round corners with an exacto knife & circle template for closre radius. I think you can measure the nuts & door hinge base on your car, then use that to compare to Jeff's pic to measure size of label proportionally, using the known bolt head &/or hinge measurement. Also, SocalAndy on here has the thread to make repro VIN door stickers, if you'll need one of those as well, so PM/email him if necessary. I still need to get one from him too, but I'm still at your early 2012 stage, although I've owned my 914 since 12/75 (2nd owner also). I just saw your NOS brake calipers on your pix link. make sure you have Eric Shea at PMB (member vendor here) go thru them before using, as being an old part, the y can still need a rebuild due to aging of parts, corrosion of pistons while sitting, etc. You want to be able to stop & not mess up that newly restored baby! Thanks for the heads-up on the brakes. Eric is building a custom set of this 914/6 "Vintage Brakes" Alloy Rear Calipers for me. They will be polished and clear anodized to match the Brembo AM front calipers I have for the car. I contacted Andy (SoCalAndy) last year regarding my replacement VIN sticker. I have it put away at this time. It will be one of the last things to put on the car. I haven't had any members PM me with label sizes but I have some new calculations based on the picture I have. Based on the hinge size, I calculated the label is 28MM x 70MM. I will wait to see if anyone has a sticker before I have custom labels cut. I will add a thread to the garage section as I don't think all members venture in the Originality thread all that much. Greg, true about the O&H vs. Garage forums, so it can't hurt to put a post there too, but most of the CW's concerned about originality go to O&H. If you plan to show your 914 in PCA locally, they will only be judging prep & condition (i.e. : a cleaning & detailing contest), and originality only comes into play at the national Parade level - which ill be in Monterey in June this year. 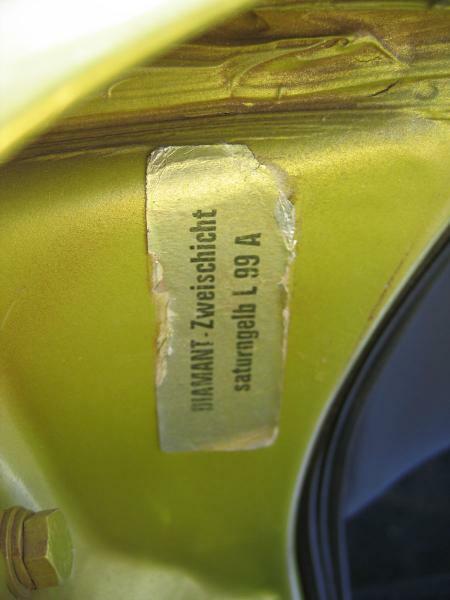 You can double check your label measurements you derived by scaling, by doing it on several of the pix on Jeff's site, but hen again - Porsche/VW/Karmann may also have had different sized labels made up over the years - if they seem widely different, but 28x70 mm seems like a good whole size & probably a standard label size for German label makers back then. Oh, you could also PM/email Steve Gaglione (smg914 I think) to measure them on his original 74 LE, 73 2L & 914-6 - all 3 are in original paint from the factory still IIRC. Sorry, just thought about him and his garage full of original 914s!! PS - It's his Sahara Beige in the O&H nailed topic: "The few, the rare...." which is there for originality reference. You should look thru that at least several times in doing your resto-mod. Sounds like you've got the brake thing in hand, just wanted to make sure, cuz I've seen some assume 30-40 year old NOS will perform fine! Hi Greg. I sent you two messages on how you might approach it. If you have any questions, feel free give me a call. If you can provide me the format your printer can work with, I can likely get you a file in about a month. Been real busy, and currently do not have photoshop on my computer. Car looks fantastic btw. Sorry I missed your posts. It was a crazy day at work. Thanks for the suggestions and offers of help. I think I have the font close but I will need to work with it this next week. I don't have Photoshop so I'm trying it the old fashioned way, trial and error. I'm waiting for a set of labels to arrive from the vendor. They should be close at 1.125 x 3.0 inches. I will let you know how it goes by keeping the thread updated. Here is my latest proof on the size and font. The sample is not in foil at this time. I wanted to test the size of the label and the font. I didn't bother with the rounded corners. The final foil label with have slightly rounded corners. The label is 28mm x 77mm. Using this size label keeps the same height length ratio of the original label. The font is 20pt. Still need some work on the "L 80 E."
Looking real good Greg. Your font seems to be just slightly more compressed (narrower width) than the factory font. If you can bring the original Porsche label into your paint system as a background layer, and your font in as a top layer with transparency, you should be able to get it perfect by scaling the font you plan on printing with. The background layer you'll have to rotate. ....slightly thinner on the font face too ... I think they call that demi-bold as opposed to the bold font, or something similar. Also, the bottom loop of the "e" is closed in a bit more than on the OE sticker, if you can trim it or look at another version of that font (many versions out there: knock-offs like TrueType, Bitstream, original Helvetica series, etc.). Hi Tod, nice to see you're still kickin around .... but wut!! .... no 914! See the following pictures. I'm trying to factor in serveral images to come up with a common font style. My sample is a bit narrow though. Gotcha Greg .... as with many things 914, it varied from car to car, MY to MY, etc. You'd still need to open up the slot on the lower case "e" on yours, even with the bold-condensed font of these other 3. My thinking was that the bold may be closing it off too much, & maybe demi-bold/semi-bold condensed font would open it up just enough ... worth a couple of mouse clicks & test print on plain paper to see anyway. Otherwise you'd have to use photoshop or some font customization/graphics program to open it up. Greg in regards to your spacing, the L and 80 should be one space over to the left. Look which letters they fall under on the original label. L falls under the "el", 8 falls under the "l". 0 under the "e". Don't mean to nit pick it, but seems like you want it perfect. I noticed that early on. I will see what I can do! The font you're using looks like Impact ? Impact is like microsoft version of univers which isn't quite right either. I think the font is supposed to be DIN engshrift. 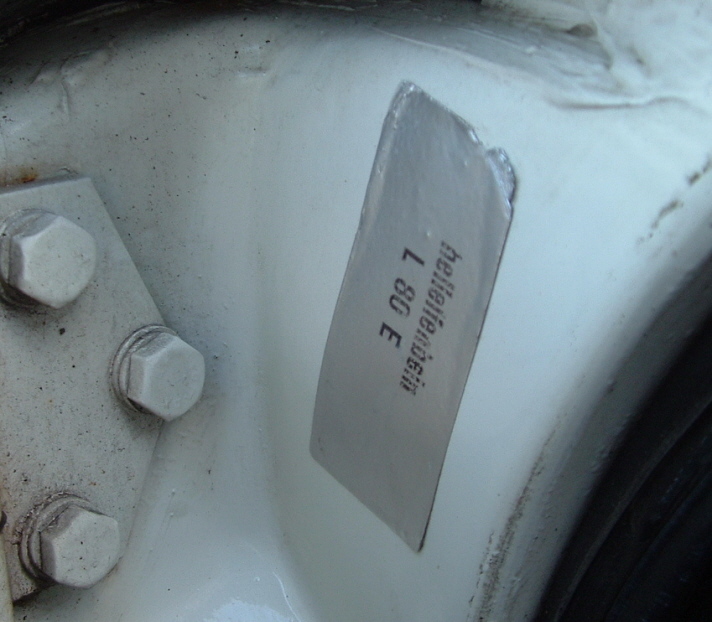 I have a 'L50k neptunblau' sticker like this in my bus, I will have to measure it. That font looks PERFECT. I will download it in the morning and get a new sample. I can tell its correct when looking at the 6 and 9. They are very unique. Starting to come together Nice find Nathan. I downloaded the DIN Engschrift Std font. The standard strike is too thin. Bold is too thick. Is there a demi-bold? I looked on the site but I couldn't find a match. Also, the lower case L is incorrect. There are a bunch of digital versions of it, but the font predates modern digital typefaces. Some of them you will see the 4 is open like it is, say on the speedometer, some it is closed. Another difference I see is the sticker, the 'a' has a tail that none of the fonts have. You can get the font for free, but sometimes the font isn't as refined a version as it could be, the space between characters will look off, the proportions will look off. 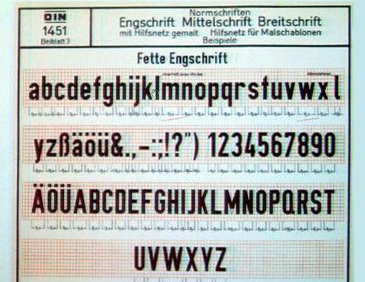 The original version that vw porsche used was probably done with film or letraset. FF makes DIN pro which is really nice (and expensive) and has many weights and titling versions etc. I will check tonight if I have it, I probably do, as a post script mac font. I could convert it to a pc truetype I think - I have an old laptop that has all my old fonts from the NYT and MTV and a version of transtype 2. I will see what I can find. Nathan - nice to see someone step in who is more schooled in typefaces/fonts etc., and someone who knows old school Letraset as well. There is an off-chance that VW & Porsche's vendor for the sticker back-in-the-day actually took the Letraset & modified by hand (ink & xacto blade) certain letters for a particular customer, as was the case for the actual "PORSCHE" Script used for the badges (I don't recall which script they started with). But you all probably noticed that Sir Andy had modified the 914world logo (4 & W most noticeable) to generic font for fear of legal action - a shame really that Porsche cracks down on their "unofficial" enthusiast site like that! So Greg may have to do the digital Photoshop equivalent of that, or else track down some old school Letraset/other transfer letter sheets in the appropriate Demi-Bold-Condensed & do it by hand, then scan/photo to digitaize it to match. IIRC they are still produced in sheet form & sold at some art/architecture/engineering/graphics stores around (often near colleges/universities/art schools) for those case where folks are still producing one-off physical pieces needing formal lettering (as opposed to hand lettering or digital art). ....ahhh yes! The days ....er all nighters.... scrambling to finish off those dang rub-on letter notes in the studio while bleary eyed from lack of sleep. Those were the days!! Good work & collaboration guys! I gave the fonts, my work/samples and a link to these threads to my brother today. As a web developer, he's a Photoshop wiz. We will see what he comes up with! The pictures below are where I left off. The labels are 28mm x 75mm. The font size is 20pt. They look (IMHO) close. These are stock cut labels. I may need to have custom labels cut to get the corners a bit less rounded. These are laser labels and were printed on a commercial color printer. Even though they are black, the color printer prints a deeper black than a standard commercial black/white laser printer. I will take a few pictures this weekend with a foil sample on my car. I did find this site in the uk that has really good-looking ones. They are a vw site so maybe wouldn't have all 914 colors? They do have a really long drop down list of codes there, in seemingly no order whatsoever. For the MY 70-76 - both VWs & 914s had the same colors available (less for 914), not counting the 98 paint to Porsche color & 99 paint to match [sample] options for 914s & many of the Porsche colors had a VW counterpart with a different marketing name in many case. So depending upon how thorough the UK guys were in making their list, it may cover all 914 stock colors (1 stage & black + 2/3-stage metallics), since the Super Beetles at least had color options pretty much mirroring the 914 choices. IIRC the later 914-6's color names & code numbers would match-up after Porsche standardized the colors, but early 914-6s using different Porsche naming/numbers would not (or was it the other way around? ). A good listing with sample 914 cars in actual colors is at p914.com under paint colors, as well as other originality by MY info. Greg, I think what you have is a passable repro and probably matches very close to one of the sticker batches that the Karmann factory used - if not precisely exact. Thanks for the feedback. There is a slight modification I need to make with the current font spacing. On comparison last night, my wife and I both noticed there is a bit too much space between the characters. I can easily correct that. I just got word from my brother that he has a font sample to show me tomorrow. Knowing him as i do, it has to be very close. I will post a copy of that sample as soon as I have it. One question regarding the foil labels. Are the corners too round? When looking at some sample pictures they seem to be correct. On other samples, they seem to be too rounded. Opinions?? Greg, like I suggested earlier, have your brother bring them both into photoshop. Your working layer and the original. You won't be guessing about spacing, size and kerning. And, you'll save yourself a lot of time. Labels are looking real nice! I did this real quick test in Photoshop so you get the idea about aligning the text. The bottom layer I had to adjust the perspective on. With the correct font, you should be able to replicate it perfectly. This took about 10 minutes. I worked with my brother today on fonts. He found a font that's a 95% match. Now that he has a font, he will pull the label into Illustrator to perfect the spacing and kerning. The only thing we will be missing is the small tail on the lower case a.
I will have a PDF sample later this week. I need some feedback regarding the size and corners on the label used in my pictures above. They are 28 x 75 mm. I would prefer to use a stock label rather than have custom labels made. Your thoughts? That's fantastic Greg. Very likely he can modify the "a" for you. If your labels are the same height and width as the originals, I think your good. I had to distort and skew this one a bit to check the corner radius. It seems to be the same or close enough. These are coming along great Greg. Any plan to do a run of them?...I would be interested in a couple if you do. Yes, it's my goal to get a complete list of paint codes to reproduce. I will need to make several versions with English and German paint names (eg., saturnyellow and saturngelb) for members to choose from. That part of the project is next. I may ask for your help with the list! Thanks for your feedback and help. Without your cataloging of labels, this would have been an impossible project. Bumping this thread up to see if these ever became available. In the home stretch on stripping my car and my sticker is looking just a tad tired. I don't think these stickers are getting the attention they deserve. Don't you know that your cars will run faster, get better mileage, and emit ZERO pollution if you have one of these stickers on the car? Okay, maybe not, but I PM'd Greg and learned that the minimum buy for him to produce these stickers wasn't justified by the demand, so I started checking VW sticker sources and found reproductions for older Bugs, but not quite like these. After contacting a couple sellers that couldn't do custom, I contacted these guys on ebay who said it was no problem to print custom text and make the label a little longer to fit these dimensions. Sticker has been ordered, I'll update when it arrives to report how they did. My sticker arrived today. I ordered from this guy in the UK. Super easy to deal with. Sent a message and within minutes he responded more than happy to do the sticker with custom text and even custom size based on the dimensions posted in this thread. It shipped the following day but took awhile to get here. Looks like the letter spacing is slightly tighter than original, the space between the stem and dot of the "i" is more narrow, and I should have had him double space between letters of the paint code. But it is close enough for me. So here it is next to the image that Greg posted when this thread was active.